The media have always played a central role in organising the way ideas flow through societies. But what happens when those ideas are disruptive to normal social relations? Bringing together work by scholars in history, media and cultural studies and sociology, this collection explores this role in more depth and with more attention paid to the complexities behind conventional analyses. Attention is paid to morality and regulation; empire and film; the role of women; authoritarianism; wartime and fears of treachery; and fears of cultural contamination. 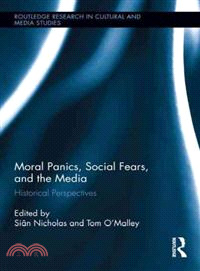 The book begins with essays that contextualise the theoretical and historiographical issues of the relationship between social fears, moral panics and the media. The second section provides case studies which illustrate the ways in which the media has participated in, or been seen as the source of, the creation of threats to society. Finally, the third section then shows how historical research calls into question simple assumptions about the relationship between the media and social disruption. Sian Nicholas is a Senior Lecturer in British History at Aberystwyth University and Co-Director of the Aberystwyth Centre for Media History, UK. Tom O’Malley is Professor of Media in the Department of Theatre Film and Television at Aberystwyth University, UK.